Do you really know what Twitter statistics measure? If you think it’s influence, think again. And if you think you’re using the best tools to measure Twitter, you’d better take another look. I’ve tested more than 45 of the current crop of 350+ paid social media monitoring platforms – which can cost $10K a month and more – and found their measurement of Twitter stats were all lacking in some way. 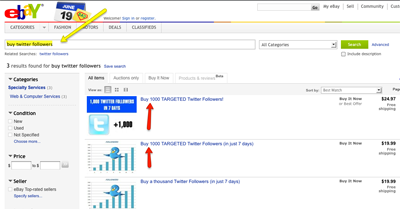 But there are some free (or very cheap) Twitter search tools that come close. 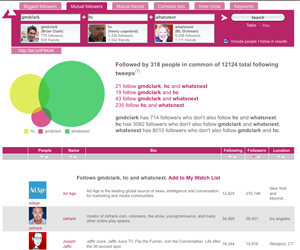 •	Comparison of three Tweeps’ followers to reveal unique and shared relationships among their followers. 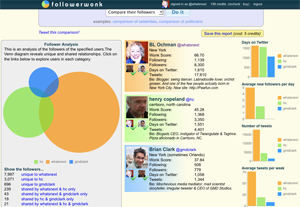 Followerwonk includes Wonk Scores – without revealing the formula by which the scores are computed. These, they explain are “proprietary rating of a Twitter user’s influence and engagement on Twitter. It ranges from 0 to 100, where higher scores generally indicate a person with greater influential activity on Twitter.” Ah, but what is influence? There’s a whole industry rising around that measurement and nobody’s got it right yet! •	map the relationships between groups of people (like attendees at a conference or a CRM list). •	Languages of your friends Tweets. •	Word cloud from friends’ bios – very useful IMO because the words one uses in a 140-character bio are very likely to be very good descriptors. •	Friends’ location word clouds – where their bio says they’re tweeting from. Add ReTweetRank to all of this, and you get a comprehensive picture of how often a Tweep is re-tweeted, and by whom. The re-tweeters are ranked by number and then by the “influence” which is determined by the number of followers a re-tweeting Tweep has. And that’s useful if half of that person’s followers aren’t spammers or bots. ReTweetRank presents an interesting set of stats, but brings us back to square one on what influence really means. So, you see, we have a long way to go before we understand Twitter’s impact, let alone Facebook or blogs. I still say that Google and Twitter soon will put all of these platforms out of business – or buy them. Until then, you can’t really know for sure whether your marketing dollars are being spent wisely, but you definitely can make lots of pretty charts and graphs. I havent used Followermonk but I like Twiangulate. Their graphs are pretty awesome. Which one do you prefer of the 2? I use them both. But Twiangulate is much more robust and multi-leveled.